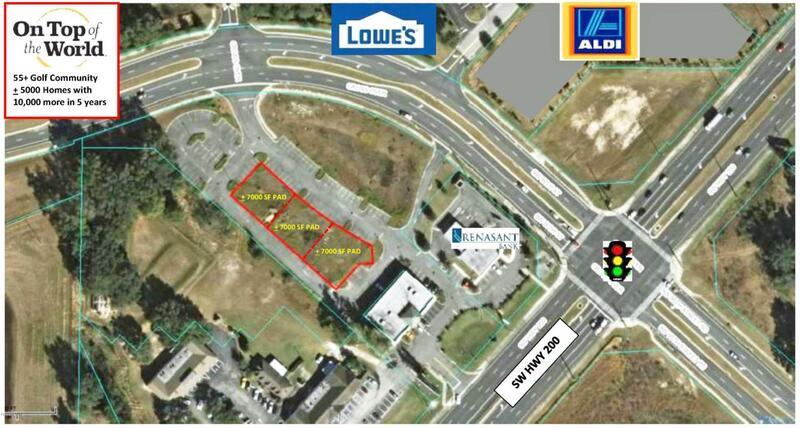 Commercial Land Ready to Build. All infrastructure is in place, utilities, parking, exterior lighting, retention. Three (3) pads are available +/- 7000 SF on which each pad can accommodate +/- 5000 SF of building. Purchase one, two or all three, draw up you plans and submit for building permit.This property is literally across the street to On Top of The World 55+ Golf Community, where their are 5000 plus homes and another 10,000 are planned to be built in the next 5 years.Ideal for Restaurant, Medical Office, Other Retail.Lowes and ALDI are across the street and Renasant Bank is adjacent to the site, and located next to Coldwell Banker Ellison Realty and Dentist Office.Please contact Harry Champ, 407-461-8812 for details and demographic report. Listing provided courtesy of Harry W. Champ of Cb/Ellison Realty - West.